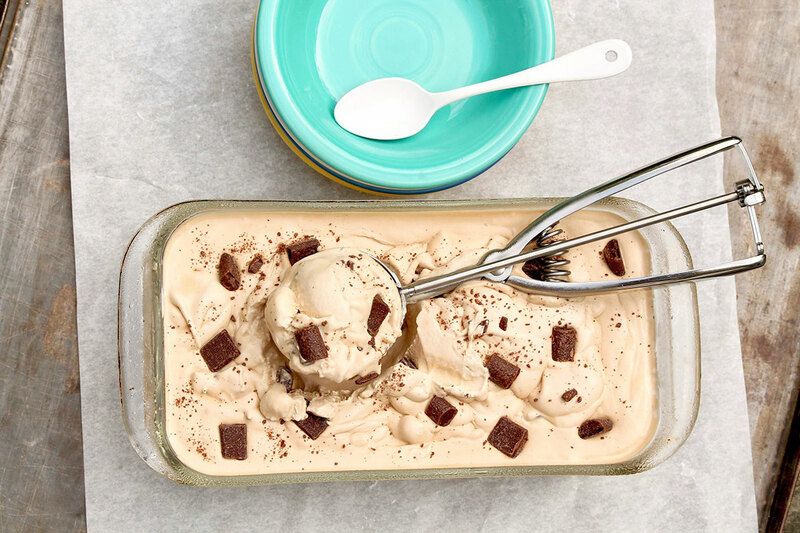 No-Churn Kahlua Chip Ice Cream is fun to make and oh so delicious to eat—and no fancy ice cream maker is required! And here we are…three years later! Where does the time go? 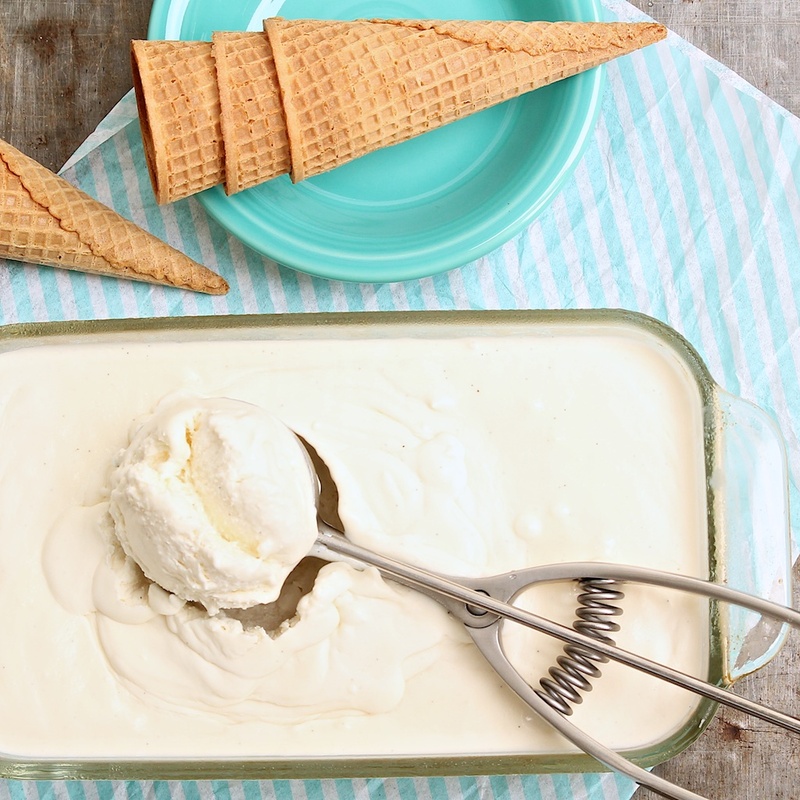 A big appeal of no-churn ice cream is that it eliminates the need for an ice cream maker. Additionally, sweetened condensed milk provides a shortcut that makes the process of preparing and chilling a custard base unnecessary. Truly, it’s as fun to make as it is to eat. If you’re looking for a great way to entertain kids, cousins, grandchildren, or simply the young at heart, this basic technique makes for a fun project with a sweet reward. So what is the best selling ice cream flavor anyway? According to a survey taken by those who make and market ice cream as well as members of the National Ice Cream Retailers Association, vanilla and chocolate came in one and two, followed by Cookies N’ Cream, Mint Chocolate Chip and Chocolate Chip Cookie Dough. But as Cary Frye of the International Dairy Foods Association (IDFA) explained, vanilla’s dominance likely stems less from consumer’s love of the flavor and more from its versatility. The survey also revealed that, when it comes to add-ins, pecans are the most popular nut and strawberries are the most popular fruit. Waffle and sugar cones were equally popular vehicles for consuming the creamy treat, and ice cream sandwiches bested ice cream cups, popsicles, cones, and bars respectively as the most popular ice cream novelty items. Where people eat the most ice cream? The Great Lakes region (which includes Illinois, Indiana, Michigan, Ohio, and Wisconsin) was designated as the most successful and most served market in the US, followed by the Southwest, Plains, and Mideast regions. And would you believe, in 2017 the IDFA reported that the ice cream industry contributed $39 billion to the US economy and provided jobs for a whopping 188,000 people! As I mentioned, sweetened condensed milk is the short cut in no-churn ice creams, as it eliminates the need for a custard base. The addition of regular milk is not often seen in no-churn recipes, but I think it improves the ice cream and eliminates an otherwise too-sweet result. When whipping cream, maximum volume will be achieved when starting with a cold bowl and beaters. If I’m thinking ahead, I combine the sweetened condensed milk mixture in advance and refrigerate that, too, although this is not required. Also, place a metal or freezer-safe glass dish (a loaf pan works well) in the freezer while you’re assembling your ingredients. The ice cream will freeze more effectively when transferred to an ice-cold container. I adore the addition of chocolate but keep the amount reasonable so that there is plenty of creaminess amidst the chunks. Feel free to adjust to your preference and reserve a small amount to sprinkle on top if you’re going for the pretty factor. Although tempting to add more Kahlua, a little goes a long way. In a medium bowl, combine the sweetened condensed milk, 3/4 cup milk, Kahlua, vanilla, salt, and the espresso/milk mixture. Set aside or cover and refrigerate until ready to proceed. Fold the sweetened condensed milk mixture into the whipped cream, adding the chocolate chunks at the end. I find that a whisk will do this most effectively. You want to be careful not to totally deflate the cream. That said, it will become soupier. This is okay. I stop mixing when I still see some pea-size pieces of whipped cream. Fold in the chocolate. (Chocolate covered coffee beans would be a nice option for those who enjoy.) 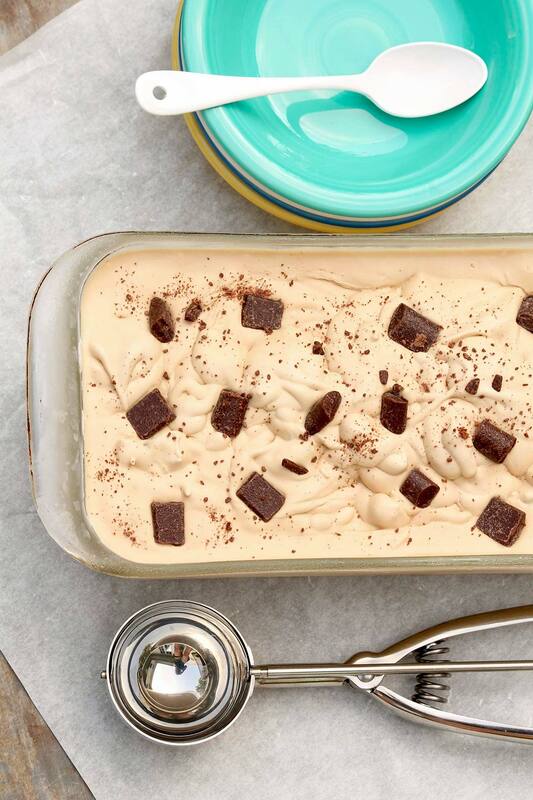 Spoon the ice cream into a freezer-safe container and freeze for at least 6-8 hours. (No churn flavors without alcohol are usually ready within 6 hours. The addition of alcohol causes the ice cream to freeze more slowly.) 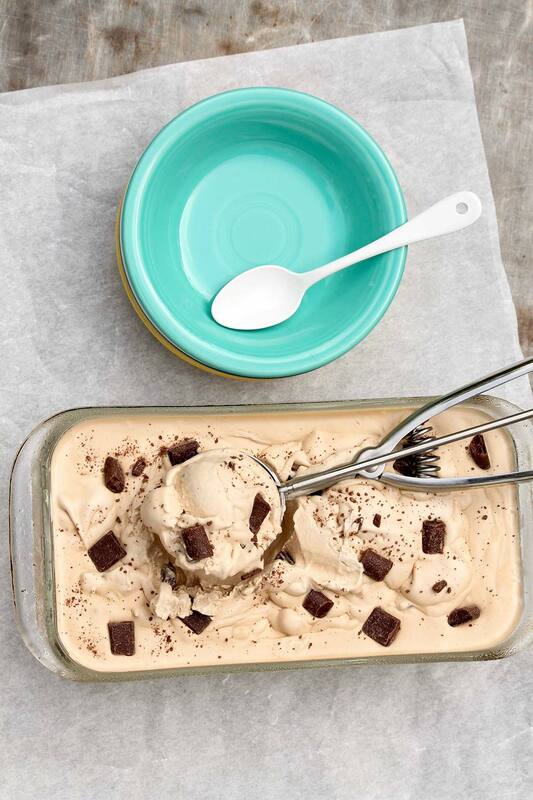 Once the ice cream has been frozen overnight, it’s best to let it soften at room temperature prior to scooping. Homemade ice cream tends to freeze harder than store-bought varieties due to the absence of stabilizers. When whipping cream, maximum volume will be achieved if starting with a cold bowl and beaters. If I’m thinking ahead, I combine the sweetened condensed milk mixture in advance and refrigerate that, too, although this is not required. Also, place a metal or freezer-safe glass dish (a loaf pan works well) in the freezer while you’re assembling your ingredients. The ice cream will freeze more effectively when transferred to an ice-cold container.